Driveway and sidewalk bumps are no match for the John Deere Get Around Gator™. Officially-licensed by one of the best brands in the world of farming and tractors, the John Deere Get Around Gator™ features the popular RSX Gator™ styling. This is a single seat, foot powered riding vehicle that provides tons of creative ways to have an awesome outdoor adventure! Produced by TOMY. Features include popular John Deere RSX Gator™ styling, 360 degree swiveling front wheels for easy turning, dual opening doors for easy child in/out access, and a squeaker horn and clicker key for added fiddle factor! This foot to floor ride-on can be kid powered or parents can help push the gator around for even more fun. 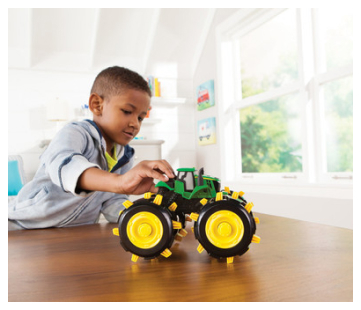 This John Deere Get Around Gator™ is intended for children ages 18 months+ with a weight limit of 80 pounds. Adult assembly is required. Please follow all of the safety guidelines set forth in the included instruction manual. Assembled Dimensions: 34.00” long x 16.00” wide x 34.00” high. Full color spot label package.